Quinta típica de escolha com piscina, pontos de vista e A / Cs. A fazenda Tal-Hnejja tem mais de cem anos e é uma jóia no idílico e famoso vale de Lunzjata. Esta área está repleta de vestígios históricos, arqueológicos e geológicos que levá-lo de volta no tempo para quando Gozo era um paraíso para poucos habitantes e rica em flora e fauna. Em poucas palavras, é o lugar ideal para o turista exigente. A entrada é de um hall que leva a uma sala de pequeno-almoço ao lado da área do convés. No primeiro andar encontra-se uma cozinha aberta / jantar / lounge com TV a cabo, Wi-Fi gratuito, DVD. Além de três quartos que dormem oito fornecer acomodações confortáveis ​​e todos os quartos estão equipados com A / Cs. Estas unidades estão ligadas a um contador de moedas. Encontra-se um controle remoto em cada quarto. Quarto principal tem uma casa de banho privativa. Um chuveiro extra também é encontrado. A máquina de lavar roupa e cozinha totalmente equipada também são fornecidos. Livre acesso à Internet e leitor de DVD também são fornecidos. A área de deck e churrasqueira que rodeiam a piscina agradável proporcionar um lugar acolhedor para todos os visitantes. Serviço rápido e personalizado inclui: Livre serviço de limpeza semanal. Embalagem de alimentos grátis na chegada. Recomendação para restaurantes. Encontrá-lo no ferry. No pedido, a um preço barato: Carro alugado. Transporte do aeroporto para casa de fazenda. Ensinando inglês. Passeios de barco para Comino e Lagoa Azul. A lovely and quiet location in a beautiful setting. We were enchanted. This is a holiday that stands out for us. 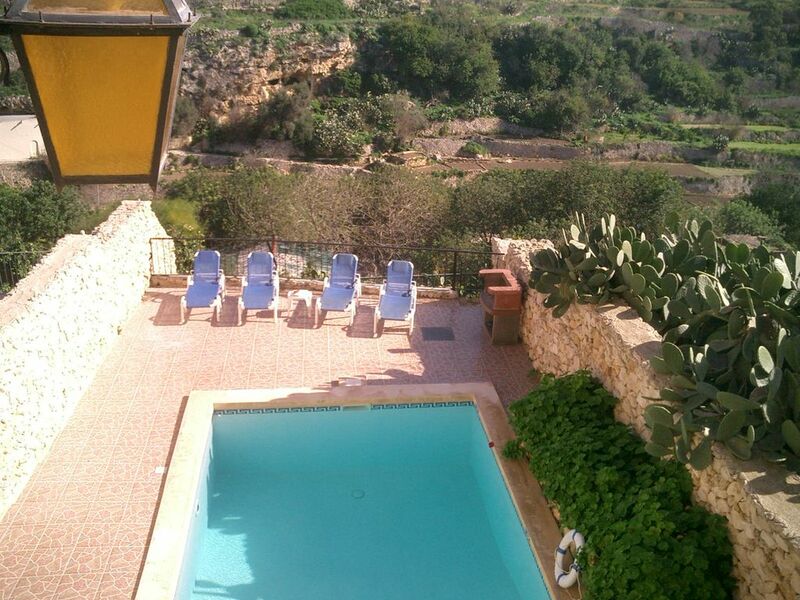 We loved Gozo and we loved the house. It was everything we needed. Mary arranged transport to and from the airport, checked in to make sure we were settled, and arranged a hired car which it turns out we didn't need at all. Das sehr gemütliche Haus in einer reinen Wohngegend von Kercem wird zwar für acht Personen angeboten, es war aber auch für zwei Personen nicht zu groß. Der Garten und der Pool sind für die Nachbarn fast nicht einsehbar, so dass man dort seine Ruhe hat. Parklätze in der Straße sind ausreichend vorhanden. Die freundliche Vermieterin Maria war stets für uns erreichbar und hat bei Fragen/Problemen immer sehr schnell reagiert. Wir haben den Aufenthalt sehr genossen und würden das Haus jederzeit wieder buchen. Second visit to Gozo and as lovely as ever. The accommodation is fairly basic but clean and tidy and very spacious. Pool is lovely , air con in the bedrooms very welcome and the view from the balcony and terrace of the Citadel is fantastic. Cosy, lots of atmosphere, relaxing, great pool, wonderful view and surroundings; Really nice hosts! When staying in Marias house, Gozo seems to be one of the friendliest places on earth. You open the street door, and are being met by warmth from the sun, and from the people of Kercem. Do your everyday shopping at Joe's local discount market -and set aside some extra time for talking with Joe himself, or his wife. You really feel welcome! And, attend a morning ceremony at the local church; Pay respect, and you meet respect! The Gozian "capital", Victoria is just a 20 min. stroll away -a hot but nice stroll, in the summertime. Here you find everything a modern person needs, in a moderate, manageable scale; Restaurants, bars, modern supermarkets, shopping, ATM's, markets, ec. Victoria can be lively, also the traffic, but never hostile or unfriendly. Gozo has a lot to offer, for people who are interested in history, small beaches, nature, snorkling etc. You can get around by local busses, but we choosed to call for a local minibus, and agreed on the price for the transportation, from time to time. We were seven persons, it worked very well for us, and was certainly not expensive; Maria helped us to find taxi companies (we want to recommend Mike - MCM Garage- he was reasonable at price, punctual and a nice guy). We were seven persons -adults, and teenagers. The house was perfect for us. Its not "fancy", but cosy, functional, and with a lot of atmosphere. Maria and her husband, who live across the street, are very friendly and obliging. If there's anything you need, don't hesitate to ask them. We highly recommend a stay in Maria's house! We do our best to keep our guests happy and have a nice holiday. Charming, private, peaceful and yet central. From Nov-April & Oct rates quoted are for 2 persons. We accept smaller or larger groups.Please enquire for prices regarding smaller or larger groups. Ask for a quote if less than a week. Note: Prices may be subject to change at the owner's discretion.